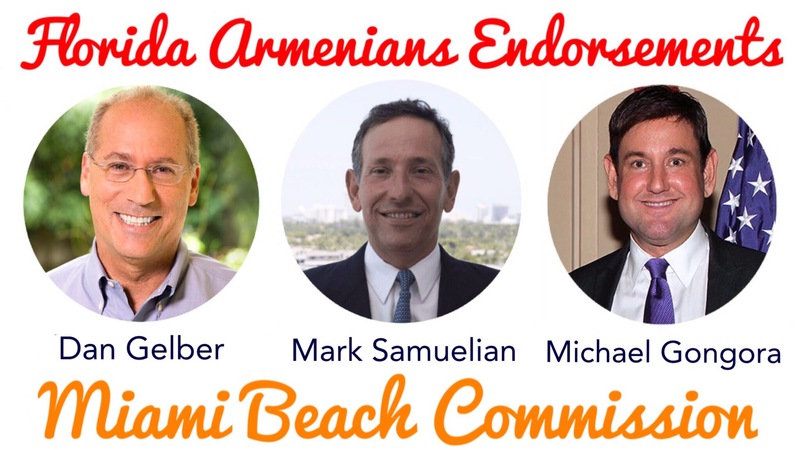 Florida Armenians also support Micky Steinberg for Miami Beach Commissioner, Group I. She is running unopposed, therefore she will automatically be elected and will not appear on the ballot. We are especially proud to support fellow Armenian American Mark Samuelian. We believe his unique story, strong academic and business background, commitment to residents, and passion for public service will greatly serve the people of Miami Beach. Read our exclusive interview with Mark Samuelian here. Posted on November 1, 2017, in General Update, News, Politics and tagged Dan Gelber, Election 2017, Mark Samuelian, Miami Beach, Micky Steinberg. Bookmark the permalink. Leave a comment.